The complimentary breakfast at our stop in Middleton, New York was top notch. After what seemed like a short drive compared to the long stretch the day before, we were jogging into the Minute Man visitor center to watch a highly-rated introductory film about the first shot of the Revolutionary War. Jogging - yes, not because we needed to stretch, but because I had prepared a schedule and I wanted to stick to it. I had arranged for a private tour of the village green, where the first shot of the Revolutionary War was fired, and it was important that we arrive on time. My dad, the history buff who once made a group of grade school grandchildren research both a battalion and a general in order to prepare a presentation to share with their cousins during our forced-march visit to Gettysburg, was jealous of my per-arranged tour. The guide was informative, and while our incoming college freshman offered a few interesting side notes here and there I couldn't help but wonder if we were actually hearing much additional detail compared to the free tours offered of the same village green. 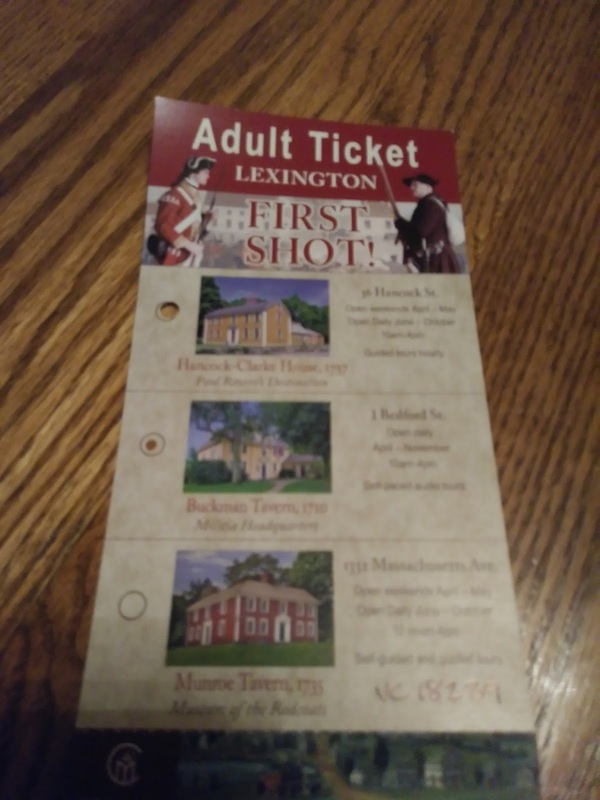 I insisted that we purchase all three tickets to check out the three houses available to tour in town, because I am my father's daughter. We began with the house where John Adams stayed when he learned of the first shot fired. Our guide here was on a mission to bore us to death with details about the economy, the family connections, and all political implications making me long for the college kid who offered a few funny asides minus information overload. Coach kept motioning/begging for us to exit/retreat and save ourselves from the tour early. He used his subtle jerk-of-the-head signal (if you factor in his 6 foot 4 inch height you grasp how difficult this is to ignore) followed by mouthing the words 'Come on!' Our entire tour group consisted of our family of 8 plus one older woman from California. I wasn't confident that we were allowed to wander thru the house unaccompanied by a historical society employee- they tend to guard these relics with strict rules and eagle eyes; nevermind, there was no discreet way for us to abandon ship. Once the kids caught wind of Daddy's lack of interest, I became a villain in the eyes of my offspring. When we were set free to the outside world, I was the target of a verbal lashing. What was I trying to prove? Did I follow that boring woman's monologue at all? Coach and I both wondered if she could have tailored her spiel a bit considering her audience was mostly kids. She had exceeded the hour long schedule and in the process had clearly lost most of us at least half way thru. Knowing that my dad would have been disgusted at our lack of interest, this wasn't the first time in my life I considered that maybe I was indeed adopted. After an abbreviated self-guided tour (definitely more our speed) of the old pub off the village green, we skipped the third house completely despite our pre-purchased ticket. The information was beginning to feel repetitive. The house we skipped was supposed to offer a glimpse of the Redcoats perspective. Who the Hell cares what they thought of the battle that started the war? They were charging the colonists tax on their tea to finance their debt from the French and Indian War. Rude! See, I was paying attention. I decided it wasn't unamerican to bypass their viewpoint. The fam was fading fast. I made a note to myself to ask my folks for a copy of my adoption records after our trip. 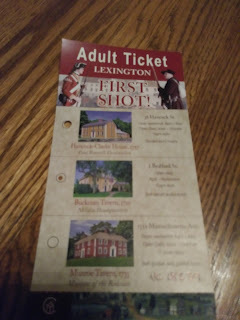 Note the unused (unpunched) portion of our ticket that allowed us entry into all three houses. We skipped out on the Munroe Tavern. My folks don't read my blog, so it is OK. They won't disown me, because they will never know. Oh, the emails I was getting from my Dad the night before we walked the Freedom Trail in Boston. It almost put me over the edge. A visit to the former home of Louisa May Alcott wrapped up our time in Lexington. The older boys were uninterested in this house, so they became ticked off when I celebrated that we had made it in time for the final tour of the day. There was a woman on our crowded group tour who insisted on firing off a ton of questions at our guide before we left one room to view the next. I became convinced that this woman was unaware that there was anyone else on the tour. You know the type, she took great pleasure in grilling the guide but then she stood there nodding as if she already knew the answer but had only wanted to quiz the guide to see if she was on her A game. She chuckled at each little anecdote the guide shared and nodded at her companion as if they had been old friends of the Alcott family and they were merely reminiscing about the good ole days. I was honestly surprised she wasn't dressed in period attire claiming to have borrowed a dress form her buddy Louisa at one point. To amuse themselves and to torture those around us, the older boys managed to silently pass some awful smelling gas each time we were ushered into the next room. They would vacate quickly but look back over their shoulder to see if anyone had been impacted. Embarrassing. Knowing that we were staying at an Embassy Suites, the excitement in our former airport shuttle was palpable. We drove to our nearby hotel just as the place was scheduled to launch the free appetizer hour. I can't call it a free happy hour, because most of the snacks are riddled with gluten, which doesn't make me happy. Additionally, we learned the hard way that in the state of Massachusetts, the Embassy Suites doesn't serve free alcohol. I had been looking forward to a glass of wine after our history infused day. The staff did agree to bring me out a small side salad since I couldn't enjoy the other snacks. I think that makes it official . . . the fact that I celebrated eating a salad over a glass of wine makes me an old lady. Let me know where you stand on that - it's OK, I can handle it, assuming I've had my nap for the day.